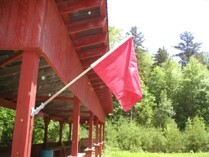 The Rifle range is open to Members and guests. 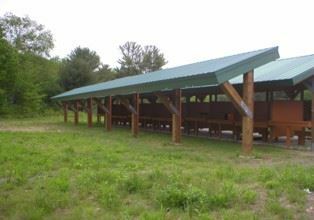 It has 12 shooting benches and movable target stancions that can be placed at 25, 50 and 100 yards. Pistols may also be fired at this range. 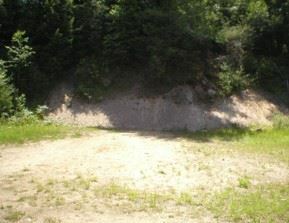 View of Shooting stations at Rifle Range. 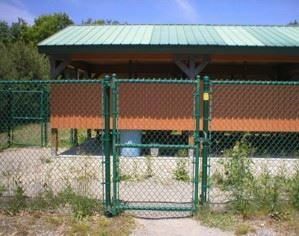 Above is the main entry gate to the pond area and the Rifle Range. This gate uses the "Main Gate" code from your membership card. Above is the Rifle Range gate. 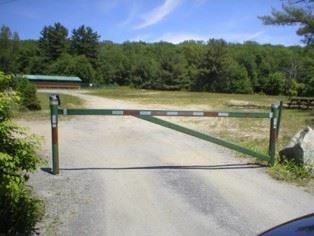 This gate uses the "Range Gate" code from your membership card. 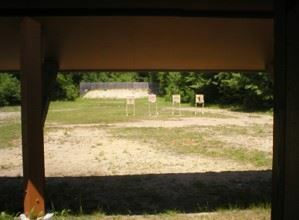 Range is approximately 25 yards with no shooting benches. Target stanchions are NOT usually provided at this range. Shooting of rifles are not allowed at this range. If you cannot see it is too dark to shoot. All ranges are closed during shotgun and primitive firearms for deer, during club scheduled workdays , fishing derbies, range maintenance and other club sanctioned events. The rifle range is also closed during the weekly scheduled trap shoots. All ranges may be closed on other dates as deemed necessary by the Range Committee. Range closings will be posted in the website Calendar. It is the member’s responsibility to be aware of the dates that the ranges are unavailable. In order to access the ranges members must have completed a "Range Orientation" prior to May 2018, thereafter the Range Rules are covered in the New Member Orientation. 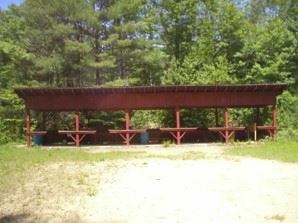 Members in good standing of the Fitchburg Sportsmen’s Club, their children under 18, and their guests may use the ranges at the club. All members must sign in on the Range Usage Log located at the pistol and rifle range and MUST have membership cards with them on the ranges. All guests must complete and sign a waiver form. These forms are located in the Clipboard located at each range. A Guest Form must be completed and signed by both the guest and the member. This form is also located in the clipboard at the ranges. The completed guest and waiver forms must be placed in an envelope with the appropriate guest fee and deposited in the Drop Box located at the ranges. Shooters are shooting or preparing to shoot. Absolutely no one forward of the firing line. Shooters can proceed downrange to check/change targets. 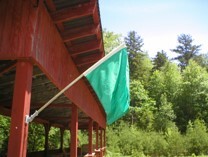 Under no circumstances should a firearm be handled when the green flag is up. This includes casing and uncasing of firearms. Safety is the #1 priority at all our ranges. If you should witness a rules violation or safety issue by anyone please obtain and complete the Range Incident Report Form.